The World Series opened in Southern California, but it was the Northern Californians who drew first blood, with single runs in the second and fifth innings. The Dodgers scored once in the bottom of the fifth, but they trailed 3-1 when they came to bat in the bottom of the ninth. With two outs, Jimmy Wynn homered to left-center, and Steve Garvey followed with a single to right. That brought up catcher Joe Ferguson, and Catfish Hunter -- scheduled to start Game 3 -- was summoned from the bullpen. Hunter struck out Ferguson, and the A's had the 3-2 victory. Ferguson redeemed himself with a two-run homer in the sixth inning of Game 2, giving the Dodgers a 3-0 lead. The A's battled back with a pair of runs in the ninth, and had pinch-runner Herb Washington on first base with just one out. Reliever Mike Marshall picked Washington off, however, and then struck out pinch-hitter Angel Mangual to end the game. Back home for Game 3, the Athletics reversed the Game 2 results with a 3-2 victory, Catfish Hunter going 7 1/3 strong innings for the victory. And Oakland took a commanding lead in the Series with a 5-2 triumph in Game 4. Trailing 2-1 in the sixth, the A's scored four times, two of the runs coming on pinch-hitter Jim Holt's single to right field. That made the score 5-2, and that's how it ended as Ken Holtzman and Rollie Fingers combined on a seven-hitter. Their backs against the wall, the Dodgers didn't roll over in Game 5. Trailing 2-0, they scored twice in the sixth on Jimmy Wynn's sacrifice fly and Steve Garvey's RBI single. 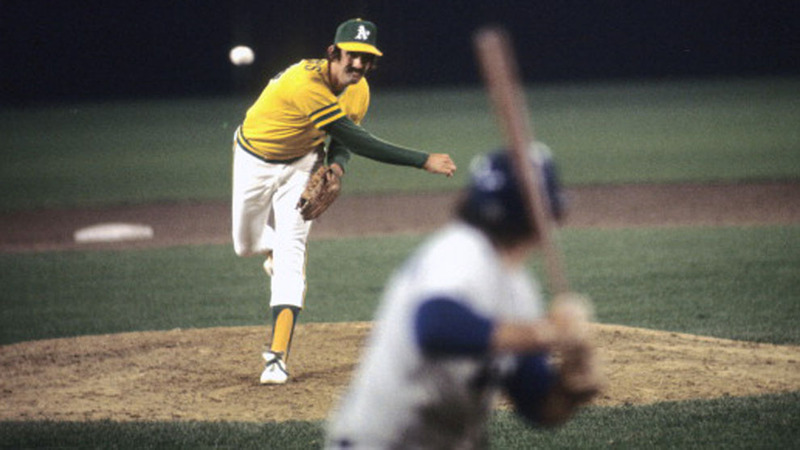 But Joe Rudi led off the bottom of the seventh with a home run, Rollie Fingers pitched scoreless eighth and ninth innings, and the A's won 3-2, thus capturing their third straight World Championship.